Sign up now and we’ll provide you with a free merchant account and equipment for your business! Agreement: The contract between the client, the processor and the bank regarding the merchant account. Application: A document that is completed by the merchant and included in the agreement. Authorization: The approval of the card issuer that validates a transaction for a merchant. Authorization Approval Code: A number provided to a merchant that confirms the authorization for a sale or service. Bank: The bank that is identified on your application. Batch: A single Submission of a group of transactions, which usually represents a day’s worth of credit card transactions. Business Day: Any day of the week excluding Saturdays, Sundays and Holidays in which banks are closed. Cardholder: The person who is authorized to use the credit card. His/her name will typically be imprinted on the credit card. Card Issuer: The bank or Association that provides an individual with a credit card. Card Validation Codes: A three-digit value printed in the signature panel of most credit cards and a four-digit value printed on the front of an American Express Card. This code is also known as CVV2 for Visa, CVC2 for MasterCard or CID for American Express. Chargeback: The client or customer disputes the transaction with their credit card provider. See More Info. Client: The merchant (you) who signs the application and is issued a merchant account and/or credit card processing equipment. Credit Card: A card that is issued by banks (Visa, MasterCard, Discover, American Express) that can be used by consumers to borrow money or purchase products and/or services. Credit Limit: The maximum amount of credit that a credit issuer will extend to a user for a particular credit card. Debit Card: A card that allows a cardholder to withdraw money or make purchases, where the costs are automatically deducted from his/her account. Dial-Up Terminal: A terminal that dials an authorization center in order to validate transactions. Electronic Benefit Transfer (EBT): An electronic system that allows a government benefit recipient to authorize the transfer of their benefits from a Federal, State or local government account to a merchant account to pay for products and services received. Electronic Draft Capture (EDC): A process which allows a merchant’s Dial-Up Terminal to receive authorization and capture transactions, and electronically transmit them to a Card processor. This eliminates the need to submit paper for processing. General Terms: The section of the program guide, including any amendments or modifications. Gross: Total amount of credit card sales. Issuer: The bank or Association that has issued a card to an individual. Magnetic Stripe: A stripe of magnetic information found located on the back of a credit or debit Card. It contains vital information about the cardholder and his/her account. Merchant Account Number (Merchant Number): A number that identifies each merchant, outlet, or line of business, which is used for accounting and billing purposes. Non-PIN Debit Card: A debit Card that is processed without entering a PIN. Operating Procedures: Processes, instructions and directives relating to processing credit card transactions. PIN: A Personal Identification Number (usually 4 digits) entered by the cardholder to submit a debit card transaction. 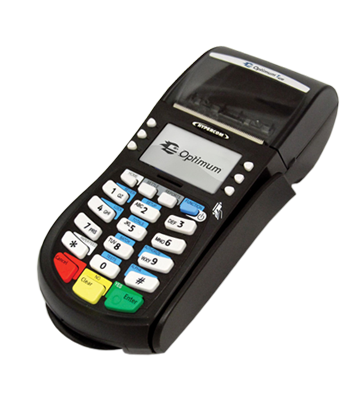 Point of Sale (POS) Terminal: A device placed in a merchant location, used to electronically process debit and credit card transactions. Processor: The entity identified on the application that provides certain services under the agreement. Program Guide: The booklet containing operating procedures, etc. Recurring Payment Indicator: A value used to identify transactions for which a consumer provides permission to a merchant to bill his/her card account at either a predetermined interval or as agreed by the cardholder for recurring goods or services. Referral: The message received from an issuer when an authorization attempt requires a call to the voice authorization center. Resubmission: A transaction that was originally processed as a store and forward transaction but received a soft denial from the debit network or association. The resubmission transaction allows the merchant to attempt to obtain an approval for the soft denial. Sales/Credit Summary: The identifying form used by a paper Submission merchant to indicate a batch of sales drafts and credit drafts (usually one day’s work). Self-Service Terminal: A customer activated terminal that accepts payment of goods or services and does not accept PINs. Split Dial: A process that allows the authorization terminal to dial directly to different card processors. Store and Forward: A transaction that a merchant authorizes on his/her own when he/she cannot obtain authorization when the merchant is present. This usually occurs due to a communications failure. Submission: A batch that is sent out to a processor for processing, done either electronically or by mail. Transaction Fees: Service costs charged to a merchant on a per transaction basis. Thank you so much for setting me up with my merchant account. In such a fast paced society it’s important to be able to get my customers in and out. My equipment always runs smoothly and I have you to thank for that MRI. – Tammy D.